ZIMBABWE – HARARE – The tongue-lashing that President Robert Mugabe gave to Zanu PF’s warring factions last week regarding his controversial wife Grace’s impending visit to Manicaland appears to have fallen on deaf ears. The Daily News learnt yesterday that far from dousing the demons of factionalism devouring the ruling party, as well as the rising animosity towards Grace within the post-congress Zanu PF, the nonagenarian’s utterances may have had the opposite effect. Party members opposed to Grace and the faction aligned to her are circulating a series of messages on social media and other platforms, dissuading Zanu PF supporters from attending her planned rally in the troubled province this week. They are also accusing the increasingly influential First Lady of allowing herself to be used by the ruling party’s ambitious Young Turks, commonly referred to as the Generation 40 (G40) group, who it is alleged, are working to divide and oust the party’s leadership from power. A party insider in Manicaland who spoke to the Daily News yesterday claimed that the members who were distributing the messages were linked to embattled Vice President Emmerson Mnangagwa. “They are moving around Manicaland encouraging supporters not to attend the First Lady’s rally. The way these factional wars are developing, coupled with the failure by the leadership to deal with them, it is a matter of time before we see body bags in Manicaland,” he said. A Zanu PF politburo member, who is seen as opposed to Mnangagwa, also claimed that the people who were trying to “sabotage” Grace’s rally were supporters of the VP. “These people have been meeting clandestinely plotting to scuttle Dr Amai’s (Grace’s) rally. Yes, these senior party members (names supplied but withheld) are moving around the province and sending text messages encouraging comrades to shun the First Lady. “This is great disrespect and we will never allow this. We are fully behind Dr Amai,” he said. There are also suggestions that demonstrations for and against Grace and the G40 are being organised wherever the First Lady’s rally will be held, with police said to be on high alert already and mobilising reinforcements to avert potentially bloody encounters. An angry Mugabe once again waded into Zanu PF’s seemingly unstoppable factional and succession wars last week, starkly telling hordes of his supporters at Harare International Airport that no one in the burning ruling party could stand in the way of the wishes of his controversial wife Grace. Speaking on his return from New York, where he had gone to attend the United Nations General Assembly — and as deadly factionalism continues to disembowel his party, with Grace at the heart of the anarchy — the nonagenarian railed at his wife’s Zanu PF detractors. Mugabe was particularly incensed by reports that some senior party officials in Manicaland, who are allegedly aligned to Mnangagwa, were trying to put spanners in the works of the impending visit to the troubled province by Grace. “We hear Amai Mugabe wants to go to Manicaland this time because she does not want to interact with people from towns only, with some saying she must come to Sakubva but the acting provincial chairperson (Samuel) Undenge also wanted her in Chimanimani. “The party must also be visible in the chairman’s home area,” Mugabe said, ominously taking a position in the squabbles, just as he did when former Vice President Joice Mujuru and her allies were brutally purged from their ruling party and government positions late last year. With the post-congress Zanu PF bitterly-divided between factions aligned to Mnangagwa on one hand, and to Grace and the G40, that is believed to be fronted by Local Government minister Saviour Kasukuwere on the other, Mugabe’s statement was a clear boon for the ever-scheming G40 who are said to be rabidly anti-Mnangagwa. The nonagenarian’s statement was also a personal coup of sorts for the beleaguered Undenge, an alleged key G40 member, as the Energy minister has been under immense pressure on two fronts — with regards to the country’s crippling electricity blackouts and the factional fights in Manicaland where provincial political godmother, politburo member Oppah Muchinguri-Kashiri has been causing him sleepless nights. Although Muchinguri-Kashiri was part of the core group of Zanu PF’s leading lights who, together with Grace and the G40, led the annihilation of Mujuru and her allies, she is now seen as belonging to the Mnangagwa camp that is battling the G40 for control of the party after Mugabe. Mugabe also took the unusual step of paying homage to the security sector, particularly the police and intelligence agents. “We want to thank the police and Central Intelligence officers for the work they are doing in ensuring peace in the country … (as) we will always have weevils in our midst. “Many people come to you saying you must back so and so for this or that post. Why must you back that person? Zanu PF has laws and we support the party and the leadership that you chose, not individuals who want to impose themselves on you and causing confusion in the party,” Mugabe said in remarks that appeared to be targeted at Mnangagwa and his supporters. 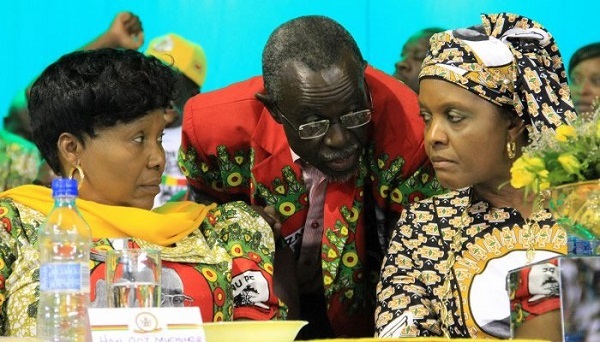 Grace’s whirlwind tours, similar to the ones she held before the ouster of Mujuru last year, have raised eyebrows in Zanu PF, especially among Mnangagwa’s allies who are wary of the motive behind the latest crusade. With elections to choose a substantive Manicaland provincial chairperson also set to be held before the end of the year, insiders said Muchinguri-Kashiri and provincial minister Mandi Chimene were backing rival candidates Mike Madiro and Undenge respectively. Symbolically, the district that will host Grace when she visits Manicaland would have an upper hand when it comes to the elections as her visit will be regarded as an endorsement for one of the two candidates. Muchinguri-Kashiri reportedly wants the venue for Grace’s visit to be Sakubva Stadium in Mutare, Madiro’s stronghold, while Chimene is said to prefer Cashel Valley in Chimanimani — Undenge’s home district. “Whatever they will agree on as the venue for Dr Amai’s (Grace’s) visit may not matter at the moment because the damage is already done. Supporters are confused and they are not sure if Amai is going to still come. “They do not know whether to prepare to go to Mutare or Chimanimani, so many may choose to stay at home,” a Zanu PF provincial executive member said last week.